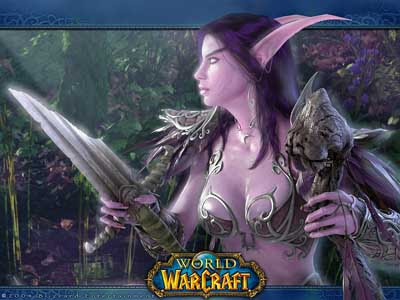 Way back in February 2008 I reported a case in California where a woman cited her husband's "crippling addiction" to the computer game World of Warcraft in her divorce petition. I concluded that post with the following prophesy: "...expect such things to be regularly cited in future divorce proceedings, as more and more people favour their virtual existence over their real one." Today, the Daily Mail (yes, I know) reports a study by Divorce Online suggesting that: "Of those wives who cite unreasonable behaviour for ending their marriage, 15 per cent believe their partners put gaming before them", with World of Warcraft being blamed particularly. The figure is up from 5% a year ago. John Bolch, Level 2 Mage and Prophet. This story got the media hyperventilating yesterday, in particular over the fact that the court awarded the (ex-) wife a further £100,000. At least one irate commenter on the Daily Mail article calls for the judge to be sacked. The judge, of course, was only applying the law, i.e. giving first consideration to the welfare of the children. That is obviously correct - the children come first, irrespective of the way that their mother has behaved. Edgar Venal Wins Top Award! Hard on the heels of Venal & Grabbit receiving the Law Firm of the Year Award for 2011, Senior Partner Edgar Venal has been awarded the equally prestigious Family Lawyer of the Year Award for 2011. The award, given to the family lawyer who is the most deserving of an award, was presented to Edgar Venal at an award ceremony today. The citation read: "For services to the accumulation of profit in the face of an increasing namby-pamby culture of mediation, collaborative law and divers other means of alternative dispute resolution." Accepting the award, Edgar Venal said: "This is recognition that I am, of course, the best family lawyer in the country, and of the senselessness of instructing anyone else. Perhaps other family lawyers will now realise the utter futility of their pathetic efforts to do a decent job for a reasonable reward." Second came Sir Nicholas "Tenerife" Mostyn, for his devotion to the cause in dealing with urgent family law matters, even whilst sunning himself on the Mediterranean island of Tenerife. Third place went to John Hemming MP. Although not strictly a family lawyer, it was felt that John had demonstrated a deep understanding of the subject, and had done more than any family lawyer to promote the excellence of the family justice system. For more details about Paul Rose, see his website. Venal & Grabbit Win Top Award! Venal & Grabbit have won the prestigious Law Firm of the Year Award for 2011. The award, given to the firm that is the most deserving of an award, was presented to V & G Senior Partner Edgar Venal at an award ceremony today. The death knell may be sounding for the idea of a presumption of shared parenting time. Not only did the Family Justice Review dismiss it in its interim report, but now a study published by the Department of Social Policy and Intervention at the University of Oxford has concluded that such a presumption is not in the interests of children, as reported by Family Law. In fact, I thought I had already heard about such a study a while back, although I can't recall where, or whether that was the same study. Either way, it does seem that the evidence against the presumption is mounting, particularly as the experiences of Sweden and Australia do not seem to have been positive, according to the Review. Meanwhile, the Telegraph reports today that celebrity chef Marco Pierre White has won a public apology from Withers, his wife’s solicitors, after they wrongly advised her to intercept his post during their divorce proceedings. The apology "was described by a source as “a massive climb-down” on behalf of the high profile law firm". So ends three years of litigation, and a bonanza for newspaper headline writers (not to mention this blogger). "There is clear evidence that the little girl wants to spend time with her father, and there is clear evidence that on occasions the mother has deliberately frustrated contact between her own daughter and the father. How any mother can sleep easy having behaved in that way I find difficult to understand and I fully sympathise with [the judge's] determination to ensure for this child the pleasure of spending time with her father and to prevent the mother from frustrating the father's persistent applications for the court's support in achieving his legitimate objectives; legitimate for himself and doubly so in that he seeks to ensure that his child is not further deprived." Whilst I am sure that these words will not satisfy the hard-line doubters, it is good to hear one of our foremost family judges expressing himself in a way with which most ordinary people can empathise. Firstly, KY v DD  EWHC 1277 (Fam), which contained a reminder of the principles that apply when orders are sought without notice (known, of course, as ex parte orders until recently). As Mrs Justice Theis DBE states, the case "vividly demonstrates what can happen when proper procedures are ignored". Secondly, and in a similar vein, R (Children) EWCA Civ 558 includes a reminder that where a child is seemingly wrongfully removed from a primary carer without consultation or consent and without apparent justification, then an urgent application without notice should be made for an order for their return, if possible on the same day. Whaley v Whaley  EWCA Civ 617 involved a husband's appeal against an ancillary relief order made by Mrs Justice Baron. Facts: The parties were married in 1987 and separated in 2008. Since the separation, the husband has continued to be based in Spain and the wife in England. There are four children, whose ages range from 12 to 20. Mrs Justice Baron found that the resources available to the parties amounted to £10.4 million. Nearly £7 million of this was made up of assets in two trusts in which the husband had an interest, the 'Farah Trust' and the 'Yearling Trust', the judge having accepted the wife's case that they should be seen as resources likely to be available to the husband. The non-trust assets had a value of nearly £4 million net (of which just over £1 million worth was in the wife's name), from which the judge deducted £500,000 for future school fees. The judge ordered the husband to pay to the wife a lump sum of nearly £3 million, leaving her with some 36% of the net assets. The lump sum was payable by the 27th May 2011. Until payment the husband was to make periodical payments to the wife at the rate of £40,000 per annum, and thereafter there would be a clean break. The husband was also ordered to pay maintenance for the children, and to pay their school, college and university fees. 1. The judge had been wrong in her treatment of the trust assets. The order could not be satisfied without the husband having recourse to trust assets, thereby putting "improper pressure" on the trustees of the Farah Trust which would require them to realise assets in order to make a payment to someone (the wife) who was not a beneficiary of the trust, in a way that would represent a departure from the previous history of dealings between the trust and the husband. Further, the Yearling Trust (of which the husband was not a beneficiary) should have been left out of account altogether. 2. The judge had made errors in her calculation of the value of certain assets. 3. Her approach to division of the assets was over-generous to the wife, as she failed to give sufficient weight to certain matters, including the "inherited and/or quasi inherited nature of the trust assets", the fact that the husband had acquired certain property before the marriage and the husband's needs generally. 4. The judge was wrong in ordering him to pay the school fees (which had always been paid by either the trust or the husband's brother) and in respect of the quantum of the periodical payments orders in favour of both the wife and the children. "In principle, however, in the light of s. 25(2)(a) of the 1973 Act, the question is surely whether the trustee would be likely to advance the capital immediately or in the foreseeable future." She concluded (at paragraph 55): "The judge having asked herself the proper question and arrived at the unassailable answer that the trustees were likely to make available such resources as the husband requests, it seems to me that [counsel for the husband] has no grounds to complain of improper pressure". Similarly, in respect of the Yearling Trust the judge had found that the assets in the trust were likely to be made available to the husband by the trustees (paragraph 57). 2. Without going into detail, Lady Justice Black found (at paragraph 72): "that none of the grounds of appeal relating to the inclusion/valuation of assets succeed. No adjustment is required to the figures that the judge took as the basis for her determination and which can be found set out at the start of this judgment." 4. Counsel for the husband contended that it was wrong of the judge to order the husband himself to pay the school fees, as opposed to accepting his undertaking to "use his best endeavours to procure the continuation of their payment", but Lady Justice Black could see no reason why the judge should not have made the order she did. She also did not accept any of the husband's arguments as to the quantum of the periodical payments orders, including an argument that the judge had failed to make proper allowance for the contribution that the wife's new partner should be making to her household. Lewison J and Mummery LJ gave concurring judgments. Henceforth, all Family Court Orders will be subject to the approval of John Hemming MP. (1) Whenever the court wishes to make an order it shall first submit a copy to the office of John Hemming MP. 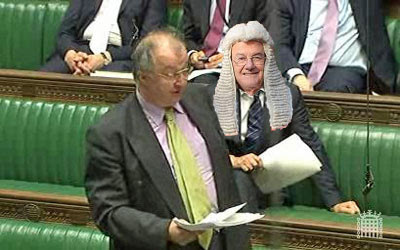 (2) No order shall be made until approved by John Hemming MP, who shall be the final arbiter on all matters legal. If a court should make an order without such approval, then it shall be named and shamed in Parliament by the said John Hemming MP. Rather disappointingly, the world did not end over the weekend. Not that Harold Camping, the originator of the 'Rapture', is likely to be disappointed, if it is true that his radio station made millions of dollars in donations (tax-free) out of the scam. Perhaps he is not as crazy as so many think he is, after all. Somewhat unusually for a Sunday, I found a new case on Bailii yesterday. Birmingham City Council v RL & Ors involved an application by the children's guardian for the judge to recuse himself on the basis of perceived bias. Not surprisingly, perhaps, His Honour Judge Owen, QC did not accept that he had been biased, and refused the application, saying that the children's guardian had "been a trifle thin-skinned, to say the least". As reported by Family Law Week, the Supreme Court today begins hearing the appeal in E (Children). The issue is the correct approach to the Article 13(b) exception to the duty to return under the Hague Convention. 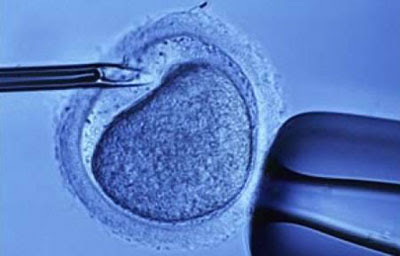 The facts, as stated on the Supreme Court website, are: "The father is Norwegian, the mother British. The two subject children were born in May 2004 and April 2007. The mother has a daughter from a previous relationship, who was joined as a party in the High Court. In September 2010, unbeknown to the father, the mother and subject children left Norway and travelled to England. Later that same month, the father made his application to the Central Authority in Norway for the children to be returned. In November 2010, Pauffley J granted the father’s application for a return order." We await the outcome with interest. "having made the decision that it is not commercially justified to attend the “fixture” would a responsible journalist nonetheless go ahead and report the match anyway? One would hope not – at least not without verifying his information / sources. That Booker has overlooked dealing with this point is illuminating." For more on this video, see here. The House of Lords yesterday debated the effects on access to justice of the Government's proposals for the reform of civil legal aid. The debate was opened by Lord Beecham (above) and other speakers included Lord Bach, Lord Faulks and Baroness Kennedy of the Shaws. Lord McNally responded on behalf of the government. You can watch the debate here (starting at 14:29), or read a transcript, here. A summary of the debate, with comments, can be found here. Venal & Grabbit ('V & G') have confirmed its associate pay bands for 2011. Pay for newly-qualified lawyers remains at the national minimum wage, while pay for those with one year's post-qualification experience will be 'a bit more, possibly'. All other associates will be remunerated in accordance with the normal pay bands, with progression being determined by such factors as obsequiousness, who is last out of the office each evening and, of course, fee income. Trainees will continue to be expected to pay for the privilege of working at V & G.
Senior Partner Edgar Venal said: "I have heard that some firms pay ridiculous salaries to their associates. Someone even told me that one firm pays over £60,000 to its newly-qualified lawyers, although I'm sure that was a joke. Here at Venal & Grabbit we think our associates should be grateful they get paid at all." I've been going through some old papers, getting my affairs in order in preparation for the end of the world on Saturday. 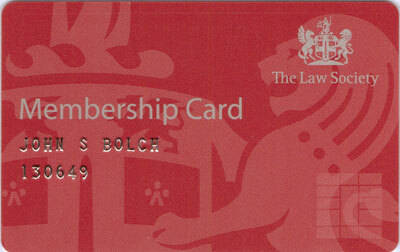 Whilst doing so, I came across a letter to me dated 17 December 2004, from none other than Law Society Chief Executive Janet Paraskeva (although something tells me her signature was just a rubber stamp) which proudly pronounced: "I have great pleasure in enclosing your new membership card which gives you access to the Law Society's Headquarters building in Chancery Lane, London." I clearly had great pleasure in using the card, as it is still attached to the letter (above). It has been pointed out to me that the first evidence session of the Work & Pensions Committee's inquiry into Child Maintenance took place on Monday. The Committee was chaired by Dame Anne Begg and witnesses included Gingerbread, June Venters QC and Stephen Geraghty, former Commissioner of CMEC. A video of the meeting can be viewed here. Should family lawyers give relationship advice? 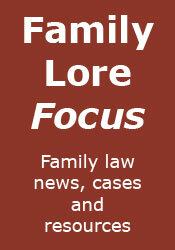 I see it time and again in blogs by family lawyers. Advice on relationships and dealing with the emotional side of relationship breakdown. I have never given such advice, either when I was practising or as a blogger, as I have always taken the view that I am not qualified to give it. OK, I may have gained some experience of such things from witnessing (at least one side of) so many relationship breakdowns. However, I have never received any training in the area, so any advice I gave would only be of the 'amateur with some knowledge' type, and so could do more harm than good. "The events in this case are a financial disaster for a divorced couple and their child." So said Mr Justice Peter Jackson, giving judgment in the case Mekarska (Wife) v Ruiz (Husband)  EWHC 913 (Fam). The case concerned an application by the wife for the annulment of a bankruptcy order and an appeal by her against a financial order on divorce. Both the application and the appeal were dismissed. All the gory details can be found in the report, but here I just want to mention Mr Justice Jackson's introductory comments, because they bear repeating, even if similar comments have been made many times before. "On separation in 2006, [the parties] might with good sense and co-operation have just about stretched their modest means to meet their overall housing needs. Instead, by 2011, a combination of dissension, misfortune, improvidence, and over-lengthy litigation in three courts, has wiped them out financially and they will now lose their only significant asset, the home occupied by the wife and child. After five years, almost nothing remains of assets once valued at £300,000. A family that had difficulty supporting itself as a single unit cannot afford to dissipate limited assets in litigation, and certainly cannot support the professional expenses of lawyers and accountants over a period of years." "The parties made unnecessary applications and failed to make necessary ones. Procedurally, the overriding objective in the Civil Procedure Rules 1998 and the Family Procedure Rules 2010 has been soundly defeated. The case has not been dealt with expeditiously, and both the costs incurred and the court time spent have been wholly disproportionate to the issues involved. With the passage of time, the result has been to eliminate the possibility of any solution that is even minimally satisfactory." I'm sure this won't be the last case where the parties dissipate their assets through unnecessary litigation, but a better cautionary example of what may happen if they do could not be found. When I began writing this blog, there weren't that many other legal blogs around. Law blogging was still a relatively new phenomenon, not taken seriously by the legal establishment. OK, there were certainly some serious legal blogs about (IPKat comes to mind), but there was definitely a higher proportion of more personal law blogs, with their own unique styles, such as Charon QC and the much-missed Geeklawyer. Gradually, however, the establishment began to realise the potential of blogging to promote businesses and further careers. More and more blawgs began to appear, from the tedious "here's a topical legal story - if you have the same problem, we can help" type, to the rather more subtle providers of detailed legal analysis, thereby demonstrating serious expertise. Don't get me wrong, though. I'm not saying that law blogs should be restricted to one type. One of the beauties of blogging is that there are (virtually) no rules as to what format a blog should take. The problem, however, is that the establishment thinks it knows best and inevitably tries to take over the medium. Before we know where we are, we have blawging mavens making their pronouncements to the minions from on high, telling us all the right and the wrong ways to do things. Worse than that, the establishment likes order. Blawgs have to be listed and rated. Now, I have nothing against personal opinions, but if the rating is by committee or vote, then you can count me out. You can also count me out of any annual award ceremony for the best blawgs by category, even if the winners are announced in reverse order. They don't just take over in the control sense, either. 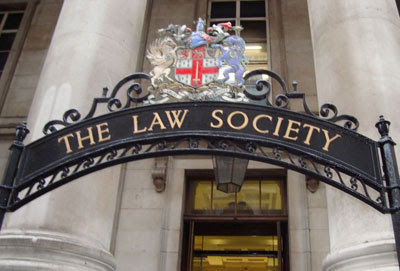 Many of the new blawgs are run by established organisations and figures in the legal community, who can use their reputation to gain huge audiences, marginalising lesser lights. It must now be far harder for a new sole blawger to gain a foothold. Then there is the content of the establishment blawg. Safe, strictly on topic. The sort of thing you could read in any legal periodical. Blogging is becoming the same as any other legal journalism. The Telegraph yesterday reported that Sir Paul Coleridge has called for an independent commission to reform divorce law, declaring that the current law was “no longer fit for purpose”. I'm afraid, however, that I rather lost interest in his comments when I saw that they were addressed to the Christian charity Care, which obviously wanted to hear Sir Paul saying that the law fuelled an "alarming" rise in marital breakdown, thereby causing “profound” damage to millions of children. You see, I do not think that the law should be used as a tool to keep couples together - no law is going to transform an unhappy marriage into a happy one. The job of the law should be to deal with the consequences of marriage breakdown, not its prevention. "Separating couples in Manchester are resolving their disputes more cheaply, quickly and less stressfully following new rules introduced by Justice Minister Jonathan Djanogly." "Family Mediation Manchester, one of the largest mediation services in the country, has reported an increase in the number of people contacting them since new rules came into effect on 6 April." Quite how this translates into the 'fact' that disputes are being resolved more cheaply, more quickly and less stressfully, I'm not sure. 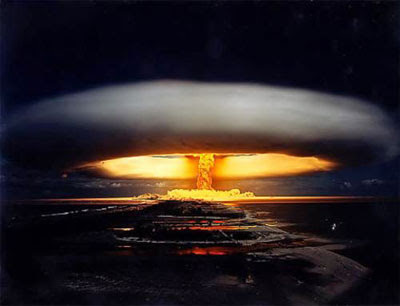 "A number of myths about expert witnesses need to be exploded. The first is that they are "hired guns" supporting invariably the side which pays them. In my experience, nothing could be further from the truth. The [Family Justice System] depends upon the integrity of the expert witness, and the duties of the expert witness to the child and to the court are spelled out in case law, in the Rules and in the Practice Direction." "Judges do not decide cases on the words of expert alone. Expert witnesses are just that. They have an expertise which the rest of us do not share, but which the judge analyses and debates in the context of all the evidence in the case. It is by reference to the latter that the judge decides the case, not simply the evidence of the expert." 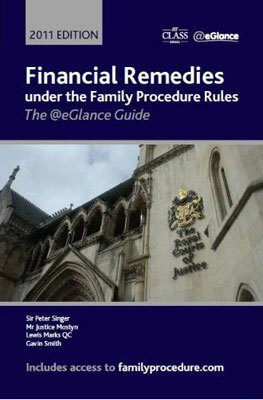 Financial Remedies under the Family Procedure Rules, The @eGlance Guide is, as the subtitle suggests, by the same authors as the FLBA's At A Glance and the @eGlance software that I reviewed recently: Sir Peter Singer, Mr Justice Mostyn, Lewis Marks QC and Gavin Smith. In fact, so far as I can ascertain, its entire contents are contained within @eGlance, comprising expert commentary and guidance on all of the parts of the Family Procedure Rules 2010 relevant to money cases, the full text of those parts and the associated Practice Directions. As with @eGlance, purchasers of the book also have access to Class Legal's FamilyProcedure.com website, more of which later. The book can be purchased on its own for £95, with @eGlance for £150 + VAT (a saving of £30) or with At A Glance for £120, a saving of £25. It can also be purchased as a Kindle e-book, raising the interesting possibility of it being used (off-line) on mobile devices, including smartphones. Obviously, the only original parts of the book are the commentaries, of which I calculate there are twenty-nine, ranging from a few paragraphs to several pages each. They can either be read as an introductory text to the new Rules or, more likely I think, as practical guidance for those using the book as a work of reference. The longer commentaries are divided into useful sub-sections, making it easier for the reader to find the subject in which they are interested. By way of example, the commentary to Part 9: Applications for a Financial Remedy (likely to be the most-used part of the book) includes sub-sections dealing with definitions, details of financial applications not covered by Part 9, a general commentary, details of modifications to the old FPR 1991 procedure, interim relief, costs, the pre-action protocol and applications to set aside. There is also a list of forms and a table of 'Correspondances', setting out the correlation between the old and the new rules. Note that the commentary does not go into detail about new rules that simply repeat old rules, for example the rules concerning consent orders. Otherwise, the book includes a fairly comprehensive-looking index, but I was slightly surprised to note that it does not include either a table of cases or a table of statutes. As I mentioned above, the price of the book includes access to Class Legal's FamilyProcedure.com website, where the commentary in the book will be updated. The site is in two parts: the commentaries and sources. Presumably, the commentaries will be updated as necessary, although it is not clear whether amendments to the originals in the book will be flagged. 'Sources' includes links to the rules, their practice directions, forms, statutes, statutory instruments and cases (where available on Bailii). That point aside, I can certainly recommend Financial Remedies, particularly of course to practitioners specialising in this area. As far as I can recall I've not seen this anywhere else, and I can't find it in Hansard, but the Shropshire Star reported yesterday that between April 2006 and April 2011 the Child Support Agency paid out more than £17 million in compensation to parents following delays or administrative errors. Some 64,703 “consolatory payments” were made during that period, with the average payment being £267. These figures were released in a parliamentary written answer to Liberal Democrat MP Duncan Hames. "I am posting this blog really as a “Dear Diary”, and to portray the daily trials and tribulations of a busy family lawyer. If I am feeling that way inclined I will also endeavour to comment on the latest case and chime in with my thoughts and opinions. I have no idea where this blog will take me, but, I will try to make it topical, funny and interesting to read." With only a couple of posts thus far published, I cannot yet comment upon that ambition, but I wish him/her every success. Oh - and a blogroll would be nice! UPDATE: Blogroll now added, I see! The final report of the Munro Review of Child Protection has been published today. The report, A child-centred system, "sets out proposals for reform which, taken together, are intended to create the conditions that enable professionals to make the best judgments about the help to give children, young people and families. This involves moving from a system that has become over-bureaucratised and focused on compliance to one that values and develops professional expertise and is focused on the safety and welfare of children and young people." The report can be found (in PDF format) here and a press notice, setting out Professor Munro’s recommendations to reform the child protection system, can be found here. The Munro Review sub-site on the Department for Education website is here. 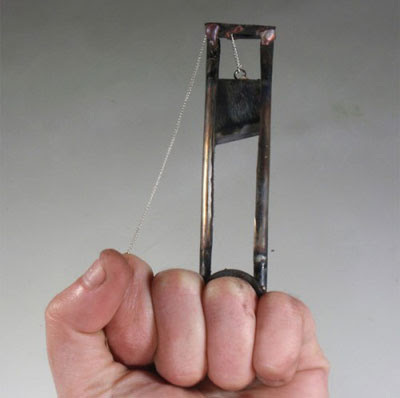 If you want your spouse to think twice before divorcing you, how about buying them a guillotine divorce ring - a snip (sorry) at just $820! May we at Venal & Grabbit congratulate you on your forthcoming marriage. We are so thrilled by this news that we may even allow our staff to listen to the Frog Song during their 5 minute lunch break. Whilst writing, we felt that it would be prudent to advise you to enter into a pre-nuptial agreement. As we are sure you are aware given your past experience, one cannot be too careful. If you agree, then we would be honoured to prepare an agreement for you, for a very reasonable fee. For more information on this video, see here. 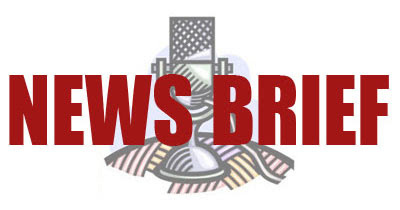 The case Re L (A Child: Media Reporting)  EWHC B8 (Fam) has just been reported on Bailii. It concerns a fact-finding hearing in care proceedings (which I will not deal with here), but His Honour Judge Bellamy also commented on media reporting of the case, in particular two articles written by Christopher Booker in the Daily Telegraph. Regular readers of Family Lore will be aware of Mr Booker and his campaign against the child protection system - see, for example, this post. Not surprisingly, Judge Bellamy was critical of what Mr Booker had to say about the case. He said (at paragraph 187) that: "Mr Booker's articles contain significant factual errors and omissions", and criticises him for "relying on partisan and invariably tendentious reporting by family members and their supporters rather than being present in court to hear the evidence which the court itself hears". "However, we should not lose sight of the fact that journalistic freedom brings with it responsibility, not least the responsibility to ensure fair, balanced and accurate reporting. So far as concerns the reporting of issues relating to family justice, the public needs to have the confidence that what it reads in the press is indeed fair, balanced and accurate. As Lord Hobhouse put it in Reynolds v Times Newspapers Ltd  2 AC 127 at p. 238 'No public interest is served by publishing or communicating misinformation.' 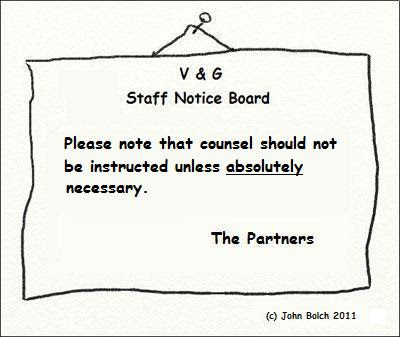 In my experience, parents involved in court proceedings cannot always be relied upon to be unbiased and dispassionate. More often, as Sir Nicholas Wall has said, they are partisan and tendentious. It is not only judges that need to recognise that but journalists too. As this case has shown, to rely uncritically upon what a parent says can lead to reporting that is unbalanced, inaccurate and just plain wrong." In a supplementary judgment Judge Bellamy also refers critically to the website www.forced-adoption.com (incorrectly referred to as www.forced-adoptions.com in the judgment), which he says published a 'sexed up' version of the first of Mr Booker's articles. 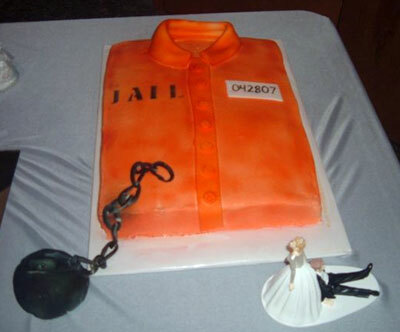 According to CakeCentral.com: "A grooms cake that looks like a prison shirt. His prison number is the date they got married... 042807. The ball and chain is made of fondant." The story was essentially about Paul Rigby, who married serial bigamist Emily Horne in 1996, but now can't divorce her, as he can't find her. Well I have some good news for you, Mr Rigby: you can divorce her. All you have to do is apply to the court for an order dispensing with service of the divorce petition on her - the order will be made if you can satisfy the court that you have made all reasonable enquiries to trace her. Once the order is made, you can proceed with the divorce 'in her absence'. You can find the affidavit in support of the application, together with explanatory notes, here. Who said Family Lore wasn't a public service? "The Mail on Sunday led on its front page story that as the duty judge, with responsibility for dealing with emergency applications out of normal court sitting hours, he was in fact in Tenerife, in the Mediterranean." Erm, sorry David, but I have to inform you that Tenerife is actually in the Atlantic Ocean, as the above graphic confirms. "a misplaced and unfair item; unfair to the judge, unfair to the duty judge procedure, unfair to the President of the Family Division, and unfair to the family justice system." Perhaps, but shouldn't the judge and the President have realised the reaction that the story would receive, if picked up by the popular media? Kernott v Jones: A matter for Parliament to decide? In 1983 the appellant and respondent started co-habiting in the appellant’s home, and went on to have two children together, in 1984 and 1986. In May 1985 the parties purchased a property in joint names, using the proceeds of sale from the appellant’s home and taking out a joint mortgage for the balance. They lived there together until they separated in 1993. The respondent then moved out and purchased another property. He made no further contribution to the payment of the mortgage on or to the upkeep of the property, or to the outgoings. In 2006 the respondent sought to realise his share of the property and in 2008 severed the joint tenancy. The appellant issued proceedings to determine the parties’ respective beneficial interests. The judge held that the appellant had a 90% share and the respondent 10%. This finding was overturned by the Court of Appeal which held that the property was held in equal shares by each party. Obviously, the decision could have huge implications, but Rebecca Bailey-Harris and John Wilson question whether the Supreme Court should "take upon itself the task from which successive governments and the legislature have shied away, namely to take steps to cure the inherent injustices in the system, taking into account changing social conditions", in this article on Family Law Week. The issue is very reminiscent of the question in Radmacher v Granatino as to whether it was for the court or Parliament to make pre-nuptial agreements binding. For what it's worth, my view is the same as it was regarding pre-nuptial agreements: that such an important change in the law should be a matter for Parliament to decide. Whilst I am in favour of reform of the law regarding cohabitees' property rights, I do not think that it is appropriate for a court, even the highest in the land, to undertake that reform. But then, what do I know? As Bailey-Harris and Wilson say: "We must simply wait and see." Lucy Reed at Pink Tape adds her own substantial number of words to the voluminous amount already published on the subject of super/hyper-injunctions (as it relates to family law) and the wisdom of John Hemming MP.